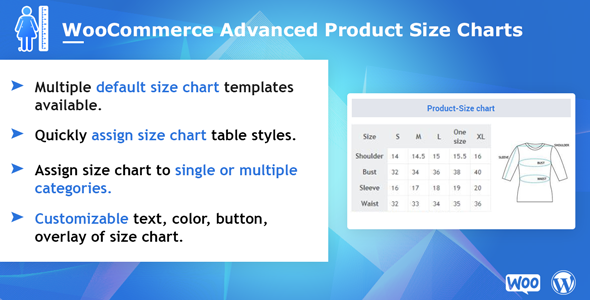 WooCommerce Advanced Product Size Chart allows you to assign ready-to-use default size chart template to the product or Create Custom Size Chart for any of your WooCommerce products. WooCommerce Advanced Product Size Chart plugin opens the possibility to create customize size chart options. With this plugin has ready made size chart template and allows you to create custom Size Charts and apply to specific category and product in your online store. Just enable the plugin, select default size chart template and assign to product or category.You can clone default size chart template and do customization as per your needs. 10 default size chart templates available. You can clone default size chart template and customize size chart as per your needs. Assign size chart to single or multiple products categories. Assign size chart to single or multiple categories. Add/Edit multiple rows on chart table as per your requirements. Default and global setting available. Customizable text, color, button, overlay of size chart. you can view assign category and product of particular size chart. Hide and show default size chart by filter option. Choose display size chart popup button position like before add to cart, after add to cart. you can apply custom css for popup button. Customers will be able to fully understand your product and buy it without making unnecessary questions regarding size.